About: Street Cat Designs jewellery is a symphony of elegant gemstones, freshwater pearls and precious metals wrapped, coiled, crocheted and knitted into exquisite works of wearable art.They are hand-made by Vancouver designer Pam Jackson, who will be exhibiting at this year’s Art World Expo. What makes Street Cat Designs jewellery unique? The uniqueness of my work comes from the techniques I use. I make everything except for chains and clasps myself. I don’t use moulds or pre-made components, so even if I were to try to duplicate a piece, no two would be exactly the same. What sort of materials do you use in your jewellery? I use sterling silver and 14K gold fill wire in varying gauges, along with natural gemstones, freshwater pearls and Swarovski Crystals and Pearls. I don’t use any plated or base metals. Where do you find your materials? I have a number of sources for my materials, but the most important is my metals. I get them from the U.S.. They are certified and follow the European Union directive for jewellery metals. This directive regulates the metals in an alloy, so we are guaranteed that none of my jewellery will contain any amount of nickel or lead. My chains and clasps come from the same distributor and follow the same directives. Why is the quality of your materials so important to you? The fine quality of the materials contributes to the longevity of my jewellery. Each piece takes a huge number of hours to complete, so I want to use the best materials possible while still keeping it affordable. It makes sure that your piece will last and last. What is your favourite material to use? The gemstones I incorporate into my jewellery are determined by many factors. A lot of the time, it’s my mood that decides what I use. Every gemstone has it’s own properties; Some will calm the mind or soothe the soul, some will aid in clarity and inner strength, etc.. As I combine the gemstones, they’ll form an elixir of sorts that will continue to aid the person who ends up owning the piece. Other times, it’s simply the colours of the gemstones that pop out from my messy workspace! Why is it important to you to create your jewellery entirely by hand? Oh gosh, there are many reasons. I guess that the number one reason is because I can! It also allows me to know the quality of the materials. Once you start to buy your components, you lose the purity of the work. I love to take the wire and loop, coil, wrap, crochet and knit it into little works of art. Can you list some ways that you find inspiration? My inspiration comes from so many places and things! From the messy desk, to current and past fashion, nature, and the gemstone properties, each piece is dictated by the mood I’m in or what i’m being influenced by. It could be something like the music or t.v. show I’m listening to, or even sunlight being filtered through the huge laurel tree outside of my studio window. How would you describe your designing style? 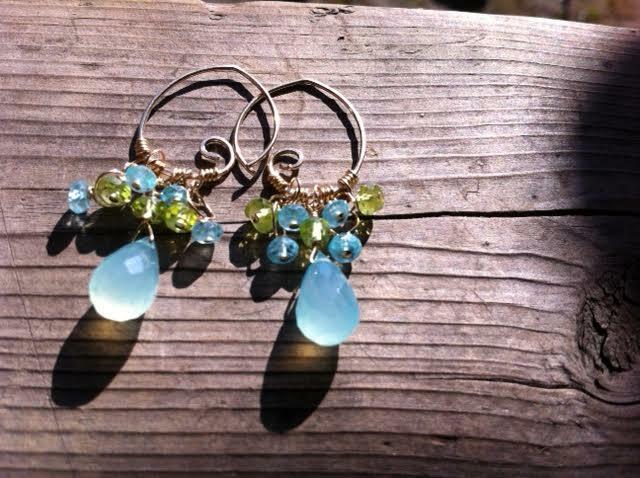 I once had someone describe a pair of earrings as “little fairy gardens for your ears”. I like that. Why do you love making jewellery? It calms my mind and gives me a sense of peace, serenity and accomplishment. Also, it just thrills me that people want to wear it! My work is available at Fine Finds, Blushing Boutique, Jeweliette, Two of Hearts (all downtown Vancouver), Favourite Gifts (Lonsdale Quay), Noir Lash Lounge (Lower Lonsdale), Tiny Finery (East Hastings), Juvelisto (Steveston), Muddy River Landing (Ladner), and Just Jewellery (South Surrey).